Canker of the hoof is a cauliflower-like growth on the corium, the frog and the adjoining parts of the hoof. Biopsies of the diseased tissue show that the damage is the result of an infectious inflammation of the corium that is caused by gram negative anaerobic bacteria in the germ layer of the uppermost layer of the skin (epidermis). Mostly it seems that the horn-producing cells are less affected than the inter-tubular horn. From this a mass of isolated horn beads result that are surrounded by a cheese-like, white mass of pus. Because this infection affects the deepest layers of the skin, the prognosis is difficult, time-consuming and expensive. The treatment of canker of the frog is very difficult, requires a great deal of time and does not always lead to complete recovery. The 12-year-old thoroughbred gelding shown on the photos was used as a therapy horse for handicapped children before the cancer set in. It was kept in a group in open boxes whereby the feed was restricted to pure oats (concentrated feed). Hay was always available. Its exercising area and box were mucked out and cleaned every day. The change of feed began slowly the day the horse arrived. 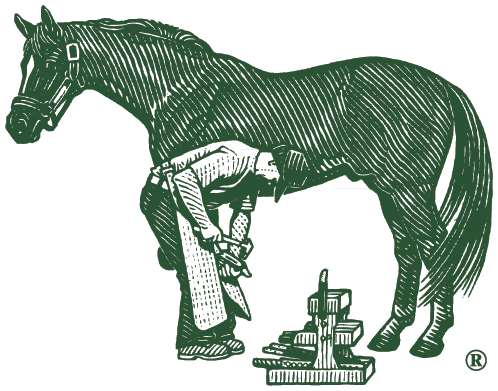 It was changed from pure oat feed (3 kg a day) to a muesli ( 1.5 kg a day) and parallel to this was slowly put onto Farrier's Formula®, increasing the amount slowly within 14 days so that the horse was then being given 1.5 measuring cups per day. The right leg was bandaged above the pastern as a lot of blood is involved in the canker treatment. During the first stage the changes in the horn on the frog, on the bars and the side wall were cut away to the required depth. 4 further treatments followed at intervals of four weeks whereby the decayed tissue was cut away deeply as far as the healthy horn. During the 2nd operation almost the whole of the side wall was removed as the change in cells was apparent in the side wall. The bandage was changed every day under as sterile conditions as possible. Apart from correct feeding rinsing with iodine form ether and subsequent treatment with hoof canker powder on the affected parts including special cotton wool (Liegasano) is imperative during treatment. After the operations described above the horse was given a six-day antibiotic course and painkillers as required. The horse was healthy by October 2006 and was discharged as cured.